Islah is a life long journey. I need to assess my condition frequently to determine how am I progressing. Have I abandoned the sinful activities I was into previously? Has my involvement in useless decreased? Are the good actions being performed according to Sunna with sincerity, concentration and humility. If yes then, are these increasing effectively? Are my interaction with others as per the praise worthy morals and manners (sabr, shukr, tawadhu, etc)? If I am not able to answer these questions positively then I need to worry. I have to ask Allah for assistance in this matter, solemnly reaffirm my determination of islah, chalk out a plan to do so in consultation with my spiritual mentor and effectively implementing it. 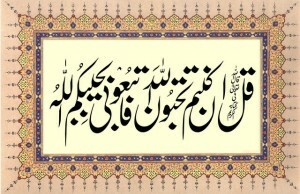 A self reminder: I can fool others by sham piety. But if I fool myself with it then I am the most stupid individual indeed. May Allah save me from this. Amin! This entry was posted in A. Reality of Tasawwuf, B. Praise worthy morals, C. Blame worthy Morals, F. Zikir & fikr, H. Whispering & random thoughts, J. Rights , T. Tarbiyet on January 13, 2016 by 'abd.